In case you didn’t realize, times are changing for buyers and consumers. For salespeople and marketers, that means your strategy should be too. In fact, your growth strategy needs to involve not only thinking about lead-based marketing (powered by inbound marketing), but also targeting your ideal customers by indentifying those organizations or accounts you desire to land most. That’s where stacking or layering Account-Based Marketing (ABM) into your smarketing strategy comes into play. Traditional lead-based marketing is about quantity, while ABM is about quality. 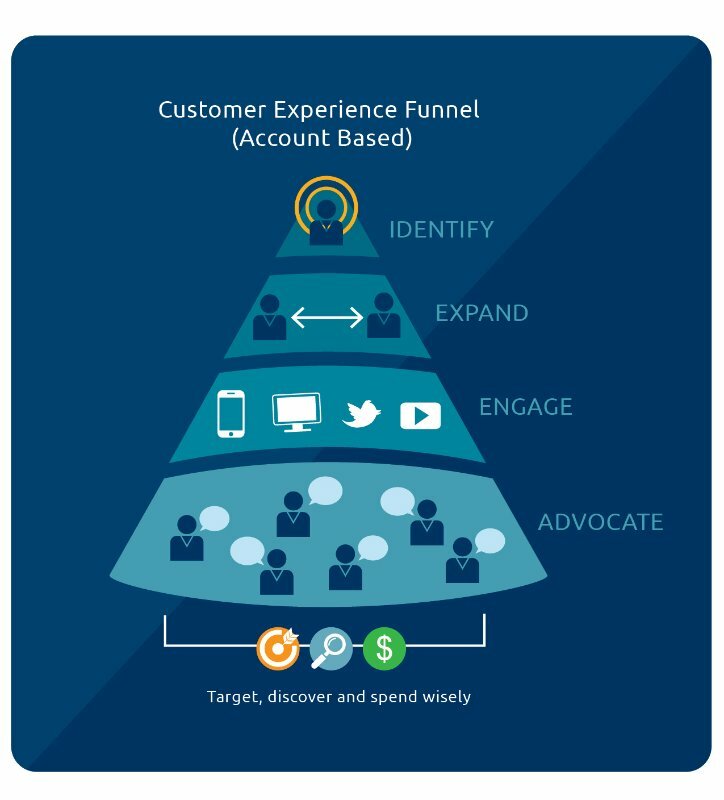 As I’m sure you know, the funnel (or sales pipeline) is the forecasting model used by B2B marketing and sales professionals to monitor new potential revenue sources. The traditional goal of the funnel is to have more leads enter in at the top of the funnel, increasing the number of closed deals. This creates a decreased cost per lead (CPL) and increased number of leads, but does not always produce increased revenue margins. Less than 1% of leads turn into customers, according to Matt Heinz, who focuses on sales and marketing acceleration as President of Heinz Marketing. ABM expert Sangram Vajre compares searching for customers to fishing. It’s like the difference between fishing with a net and with a fish finder. With a fish finder, you are able to locate and have more insight on the fish and their size. That’s what ABM does — it helps you reel in the biggest fish. Or, in this case, accounts. As we see it here at Mojo, you need both the fish finder, the net, the pole, and the fisherman as any boat would. Then, determine their budget, authority, need and time (or BANT). If you know exactly what you are looking for, you can customize your content to attract your ideal client. Winning just a fraction of those ideal accounts can mean strong returns, propetual growth, engaged customers, and sales and marketing synergy vs. silos. That’s why planning your ICP to attract ideal accounts is worth your time. Generating demand within best-fit target accounts creates velocity to get down the pipeline faster supporting sales production. Almost 85% of marketers who measure ROI describe ABM as delivering higher returns than any other marketing approach, according to the study by Information Technology Services Marketing Association. When do I want the deal to close? How can we engage contacts within the account? Doing so will decrease the sales cycle time length and increase engagement yielding pipeline acceleration (Vajre). Stay tuned for the next blog in this series, where I’ll cover the properties you need to implement ABM for your organization.